This is a very nice puzzle by Jumbo. The title is Flower Shop, by Colin Warden. It is a very colorful painting with a lot of details. 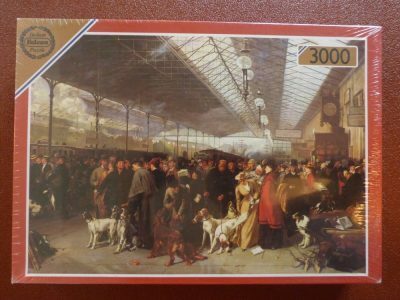 The puzzle is COMPLETE (1008 pieces). The pieces are in excellent, like new, condition. The box is in very good condition, with some shelf wear and a couple of minor tape tears in a corner of the lid. 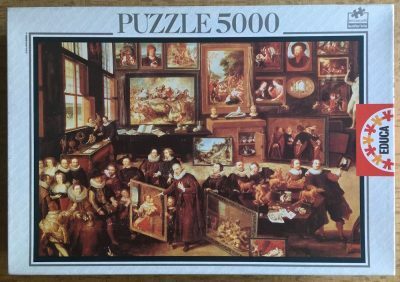 Puzzle size: 49 x 68 cm, 19.3″ x 26.8″. Other titles: De Bloemenwinkel; Bunte Blumenwelt; Chez le Fleuriste.